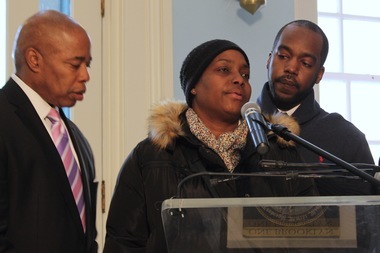 Glenn Grays's mother, Sonya Sapp, spoke for him at a press conference with Brooklyn Borough President Eric Adams, left, on March 22 in which Adams asked for an investigation of Grays' arrest in Crown Heights on March 17. Grays appeared on CBS This Morning Monday. BROOKLYN — The on-duty postal worker whose controversial arrest in Crown Heights was caught on video said his run-in with police two weeks ago could’ve been uglier had it not been recorded. Grays, whose wife is a police officer, said he was working his postal route March 17 when an unmarked police car nearly sideswiped him as he tried to cross President Street near Franklin Avenue. When he told the officers they had nearly hit him, four plainclothes officers surrounded Grays before cuffing him and yelling at him to stop resisting arrest. The entire incident was caught on video by a passerby. Once in the police car, Grays claimed the chaos continued. Grays was issued a disorderly conduct summons after his arrest. The NYPD has said the incident is under review. Police Commissioner Bill Bratton said Monday that he reviewed multiple videos of the incident and was "not pleased" with what he saw, and that the officers were supposed to be in uniform as part of their detail. Grays said he hopes the officers involved will be disciplined, but not fired. “I don’t want them to be jobless because they might have family, kids they need to support,” he said.